On Friday, July 25, before leaving Glimmerglass for the summer (Boo! Hiss! 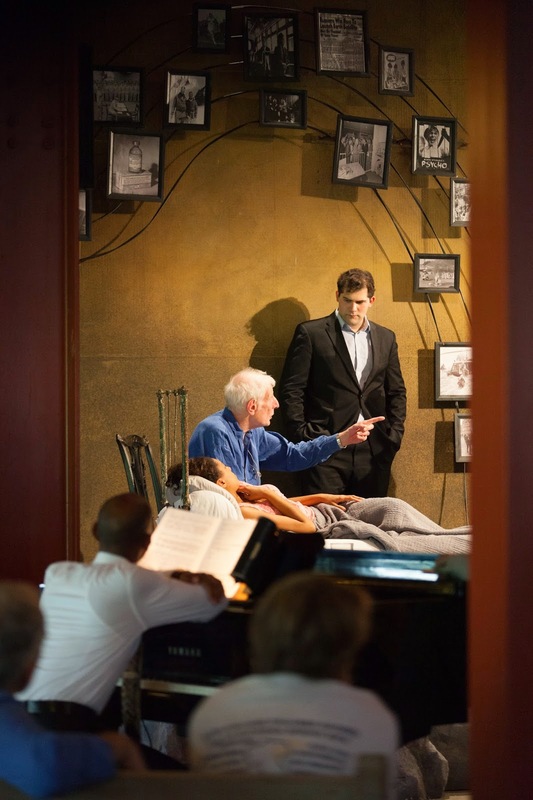 ), I was privileged to be in the audience while opera director Jonathan Miller held a masterclass--really an open rehearsal--with several fortunate members of the Glimmerglass Young Artists Program. Mr. Miller has quite an impressive list of accomplishments, including quite a long list of of opera productions, as well as stage and television. The Young Artists were presenting the last act of La Traviata, in which, as we all know, poor Violetta dies. Quite dramatically. Mr. Miller is a former medical doctor, and has witnessed many real deaths, and one of his primary goals was to make Violetta's death very realistic. Not a bit histrionic. Over and over again, he coached the young singers in real reactions, not stage reactions. Jacqueline Echols, who so charmed us in the Ruth Bader Ginsburg program, and also as the ingenue Giuletta in last season's King for a Day, sang Violetta. Mr. Miller frequently coached her to give less, less, ever less movement. A dying person has no energy, even for a wracking cough. And in truth, the more still Miss Echols was, the more effective she was. And when she was directed to actually stir about, that was more effective by contrast. As usual, Miss Echols sang with beautiful tone and musical expression. 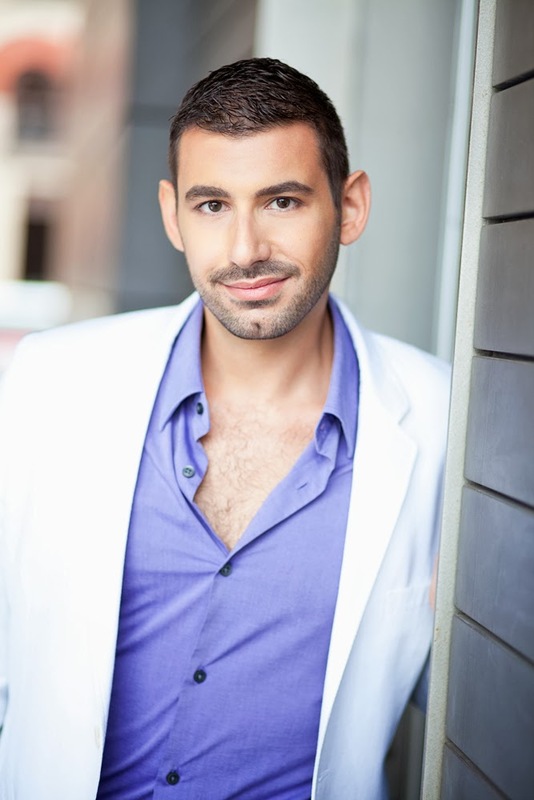 Marco D. Cammarota, who had also impressed in the Ginsburg program, sang Alfredo. Mr. Miller also took great pains to coach Mr. Cammarota. Nobody knows what to do or say at a loved one's death bed, especially if it's the first time one has experienced such a loss. Under Mr. Miller's guidance, Mr. Cammarota gave us an Alfredo who was clueless but not weak. It was an education to watch this and to gain an insight into this opera. Mr. Miller concluded with some thoughts about what one audience member termed the artificiality of opera as compared to the naturalistic way he was directing the Young Artists to act. I'd love to have a transcript of his reply to that question, and indeed, the entire afternoon, because it was brilliant. In a nutshell, he stated that man is the only animal that has this level of pretending, this state where we know it's not real but we are caught up in the emotion nonetheless. Most every culture has some form of storytelling or literature or theater where we as audience willingly suspend disbelief in order to become part of the story. To add my own opinions to Mr. Miller's statement, our culture seems to forget that theater is about the willing suspension of disbelief. Today's audiences seem to demand blatant realism in some ways while at the same time tolerating, even celebrating, "concept" productions that bear no semblance to reality at all. (To be clear, there are updated or modified productions of operas that I have liked very much.) This seems to me to be a contradiction. I won't go on and on about post-apocalyptic Parsifals under freeway overpasses and Roberto Devereuxs in boardrooms, because I've made my opinions on such matters clear before. 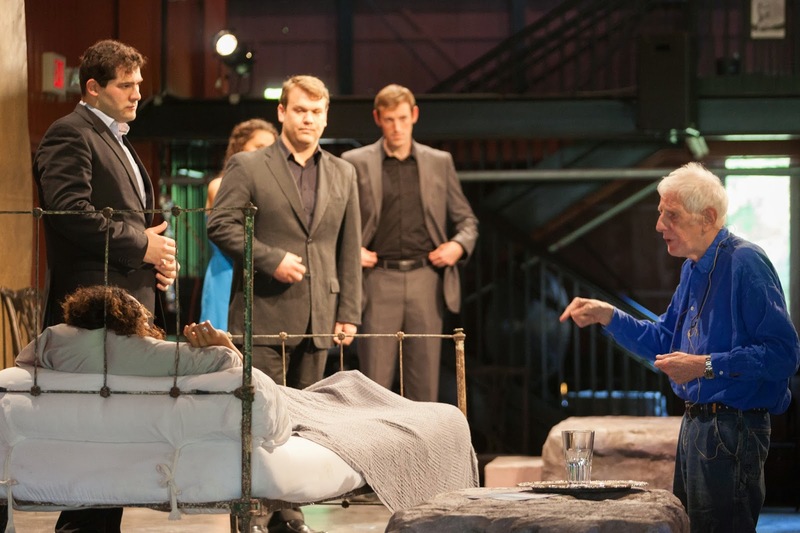 One hopes that in all these productions, the truth, the true feeling and meaning the composer and librettist intended, are evident, as one hopes the director who created such a concept is as skillful as Jonathan Miller was with these Young Artists. Last year's profile was based on questions I submitted by email, because schedules prevented a real meeting. Last week, however, I was able to get a half hour of Ryan's time for an interview in person. 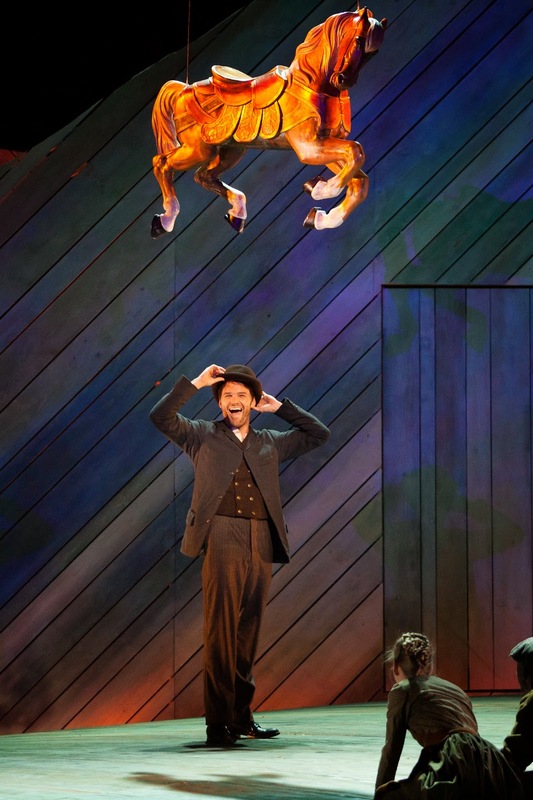 I had quite recently seen his excellent Billy Bigelow in Carousel. How have you been since last year? Really good! It was a big season for me. My first Rigoletto, which was cool—very exciting. A Streetcar Named Desire in LA, working with Renee Fleming. It's been really nice. The reviews for Streetcar were great. We got some nice press. Audience response was really good. The play is so good. The opera is good too—I think it's underrated. The story and the characters carry the whole thing. And Renee is wonderful in everything she does. Stanley Kowalski is not Rigoletto. He's a lot like Billy Bigelow (in Carousel), in a sort of talky way. It's mostly about bringing the character out. I worked really hard on characterization in the opera. Blanche gets these beautiful arias and Stanley gets this kind of aggressive music, so the trick is to make him still be real. Brad Dalton (director) and I worked hard on making that happen, and I think we did a good job. When you get really aggressive or really angry music, does it affect how you approach it vocally? Do you have to be careful in how you approach it vocally? I'm really aware if I'm getting close to something thats vocally unsafe. I try to use text a lot if I get something that's angry. I find that's more successful than a barky, angry sound. The barky sound usually reduces any interest in the text and you just hear somebody who is yelling. With somebody like Stanley, there are things happening to him that make him aggressive, but each moment is specific. You can't just be mad for the whole scene. There are different moments of frustration, annoyance, you know. And there are ways to express that that aren't just yelling. So that when those moments do come, like when you scream “Stella!” Yes, it's very intense, and there are a lot of ways you can play it. We made it a cry of desperation more than anger. So there are a lot of choices you can make, not just for vocal reasons, but for storytelling purposes, so you can create a character with nuance that you want to follow, and you're not like, “Oh, I get it—that's the bad guy.” Which can happen with something like Streetcar. It can happen with Billy, too. If you're not careful, you can create someone who is not really sympathetic, and the audience doesn't want to follow along if they hate the guy. The scream, “Stella!”-- that's really yelling? That's real screaming. I still do it in a way that is very calculated, so that I'm not in vocal danger. It still comes out of how I'm feeling as the character and what I'm doing. I didn't want the “Stella!” scream to have any kind of operatic posturing. It needed to feel sort of raw. I had done some stage screaming before. I had done a new opera in Basel, Switzerland, a couple of years ago, that had that sort of thing in it. I took the time to figure out how to do that. How to work around it to make it effective and also something I could repeat without losing my voice. You compared Stanley to Billy and said that they're both sort of speaky. Billy is very different from Dutchman! Oh yeah! Miles away! Billy might sound higher because of the color that I'm using for that character. Billy's voice is bright to me. He's from Brooklyn, come up from Coney Island. He's really kind of brassy, and the music is written for him to be brassy. In terms of actual tessitura there are some high moments, but there are also some things in Dutchman that sit very high. To me the color of the Dutchman's voice needs to have that kind of richer, darker quality. I feel lucky that I can do the color changes that are necessary for those two roles. They're not that far apart in terms of actual notes, but the sound that is expected is quite different. Anything else about those characters you'd want to mention? I think Billy is really interesting. We have a hard time in our modern society forgiving anyone for anything. We don't like that in our stories. We don't like to have to forgive someone for something bad. We do that in our real lives all the time. People do terrible things to each other and still love each other. I like about this piece that it takes a really heavy subject—the domestic abuse thing. This man hits his wife, and that really does happen, and she really does forgive him. He really learns about himself--what is wrong and how he could have done it differently. But it asks a lot of the audience to be able to go along with that. I think people are afraid of that. I think it's cool that the piece deals with it. Poverty is another thing. Billy might kill this rich guy and take his money, and we understand why. We follow along and know why he makes these poor decisions, and that gives the piece some interest. Both of your kids are on stage this summer, and they're pretty good little actors, too! I had no idea what to expect with that. Neither of my children are stage kids. Emma had been in a children's chorus piece a few months ago, but Louis hadn't been in anything. When Francesca asked me if Louis would want to play Trouble in Butterfly, I wasn't sure. He's four. He might just get all the way to the performance and decide he didn't want to do it after all. But he's having a good time and has an incredible amount of focus, which I don't always see in the rest of his life. They are both really wonderful kids. They interact with grownups a lot, so they enjoy talking to grownups. They're having a good time this summer. That was a big factor in my coming back this year—we had such a good time here last summer. You travel with your wife and kids all the time. That must be wonderful. Very challenging but very rewarding. We home school them. We're always setting them up with activities and groups and sports teams and things everywhere we go. They get lots of time with other kids. Even here--Emma is at Girl Scout camp here this week. They've both been going to a day camp in the afternoons. They're always doing something. They're not starved for social interaction. Do you envision doing that as they get older? We did some handwringing over this, thinking about what the plan should be. Now the plan is to keep doing it as long as it works, and to be flexible. There's no way of knowing what kind of kids they're going to be when they're teenagers. I know another home-schooling family of opera singers who just put their kids back in school because the oldest one was feeling like he was missing something, not being in school. It is really important to me that we spend a lot of time together. I know a lot of singers who aren't near their families very much, who are unhappy a lot of the time. That's really tough. 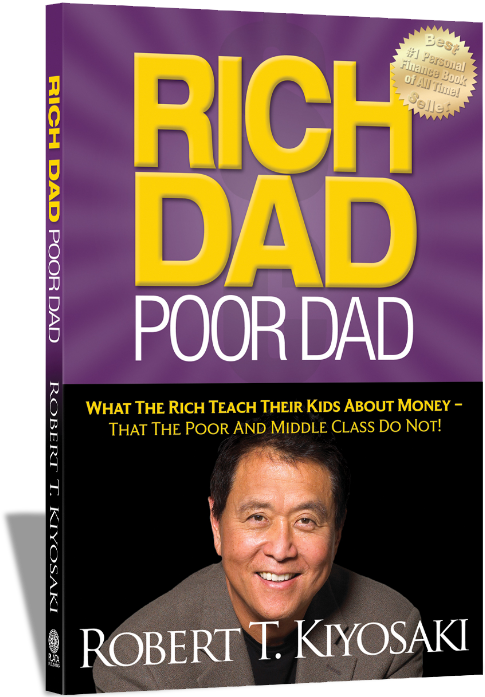 People don't always have the luxury that I do—I'm very lucky that my wife is willing to do this crazy thing and my kids have really taken to it. For now it works really well. I'll be singing the Speaker in The Magic Flute at the Met. It's a short role, but it's really cool. I'm doing my first Count in Nozze. I do both Figaro and the Count. I'm covering Figaro at the Met, and I've done Figaro a lot. It's one of those right in-between roles.I hover between baritone and bass-baritone. Billy isn't really a bass-baritone role. I think both the Count and Figaro are interesting to me and I can do them both. I also do both Don Giovanni and Leporello. They're not that different in where they sit in the voice. The only difference is the F-sharp at the end of the Count's aria. You did your first Rigoletto in Houston. Was that a big challenge—Rigoletto's postural issues? I had to come up with my own take on it, and not mimic anyone else's Rigoletto. We had a big discussion—he has not just the hump, but he has an assortment of physical problems. On one side of his body the nerves aren't working right, and his walk would be affected, and he would be in constant pain. So it's no surprise he lashes out from a place of pain. Instead of playing what I thought it would look like, I tried to play what a person would feel under those circumstances, and I think that was ultimately more successful than if I'd tried to go for the “expected look” for a hunchback. Verdi, like all really good composers, is writing about the emotional story anyway. It's not about realism. That's yet another fach—the Verdi dramatic baritone roles. I think dramatic baritone is the most accurate description, but writing dramatic baritone on a bio doesn't make sense, and baritone doesn't tell the whole story, so we still say bass-baritone. I honestly don't think about that too much—whether a role fits the name that I have for my voice. I never say yes to a project without singing through it. I try to learn a role before saying yes. For example, Rigoletto was way out of line with what I'd been doing. 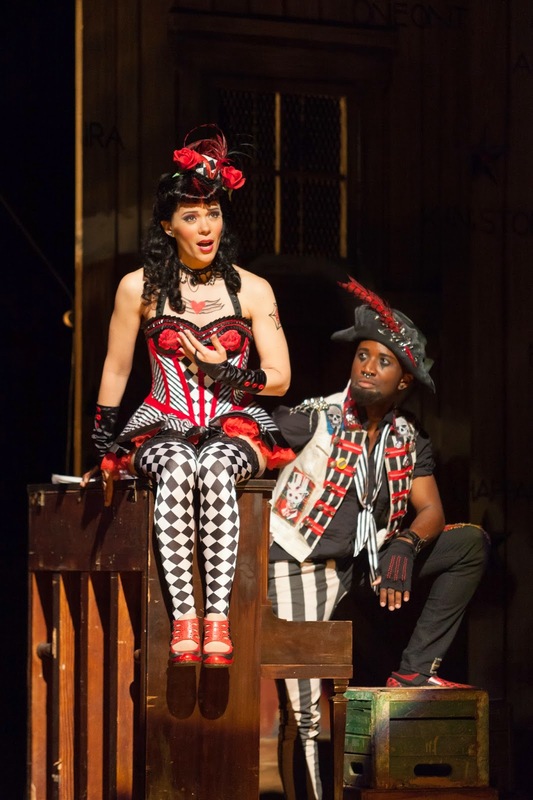 Patrick Summers (of Houston Grand Opera) asked me about it, and I said, "Give me a week." I knew the opera pretty well, so learning it took no time. I sang through the whole show several times that week. I was able to get a feel for it. I'm lucky that I'm a pretty quick study. I had good training in college. The first thing I do is look at the score. I'll see how long the role is, where it sits. I'll read the libretto and think about the character. I'll listen to the recordings. I'll sit down at the piano and start singing it. I tend to find the most nuanced moments by actually singing it, as opposed thinking about it. I do a lot of character discussion. My wife is a former actress and is a really good acting coach. She's been my acting coach for ten years. We are always talking about shows and character and choices. She's always there to bounce ideas off of, or to tell me if an idea isn't reading clearly. When I consider a new role, I don't only ask if this is something I can do, but also is it something I'd have something to say about as an artist, and would it be worth people's time to hear it? That's more the decision-making process—not so much how does this work for my career, or does this fit in my little box. 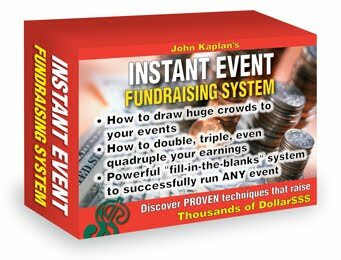 Obviously my little box is not clear anyway, and that did cause confusion early on, but nowadays people just shrug their shoulders and say, "Oh, Ryan's doing that thing again where he does whatever he wants!" Although I could have chatted with Ryan all day, we both had places to be, so we shook hands and parted. 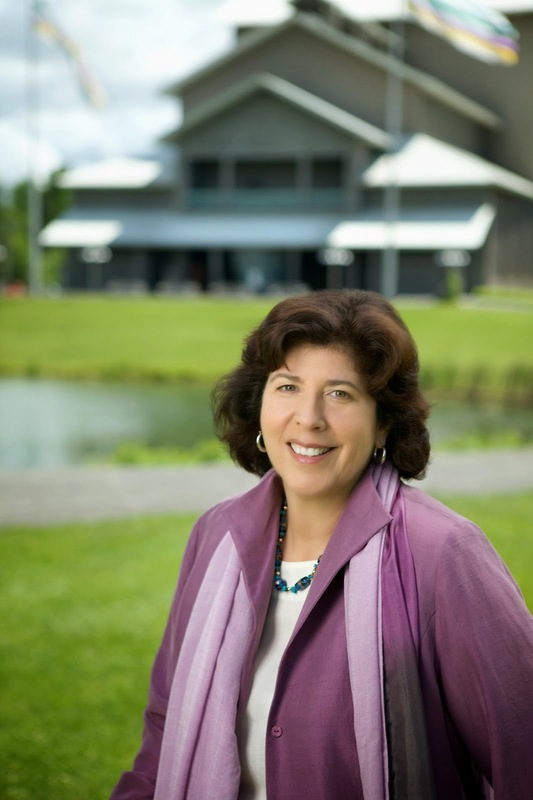 In part 1 of my interview with Francesca Zambello, we talked about running an opera company. In this part, we talk about specific productions and other topics. There was a profile associated with your Covent Garden Carmen where you discussed how important it is to be period specific and give a good sense of the time. Yet that was the same year you did an updated Aida at Glimmerglass (2012). I think with Carmen it's important to make clear that she is not only outside of society, but she's also an outsider within her own community. She's not just a Gypsy--she's even farther out. But she still has this magnetism. Not just sexually. Everyone is fascinated. Aida is about racial conflict--not black and white, but about two nations against each other and within themselves.It's about civil conflict and warring nations. The King and Amonasro are heads of warring tribes. I think we made people realize that Aida is really a story that is going on right now. Insurgence in Syria. Afghanistan. It's the same story, right? Somebody proclaims himself king and is king for a day, and then somebody else is king. It's not like there are free elections in any of these places. Carmen is an enigmatic character. Enigmatic characters are the most difficult to portray, but the ones everyone is most interested in. Many times audiences find Micaela and Liu more sympathetic, but Turandot and Carmen are the enigmatic women. Difficult to penetrate. And you wouldn't have an opera about Liu. Everything has to come from character. Narrative has to come from character--character can't come from narrative. What's Liu's conflict? Liu just wants the guy. That's all she wants for the whole show. Turandot changes. Liu doesn't change. What goes into the decision about updating or keeping the opera in the time? Each production is different. You work with your designers and you determine what is the best world or environment to tell the story. I don't arbitrarily think, “Let's set that in the 20s!” I think that's silly. If it leads you in your discussion with the set and costume designer and choreographer to a place where you think that will serve the piece, that's your decision. It's no secret we're doing an updated Ariadne here. I was very inspired by the conflict of Ariande, which is basically high art vs. pop culture. That's a pretty contemporary question. And I also have always loved the fact that central New York has all these cities with names like Syracuse, Utica, Ithaca, so I thought why isn't Naxos here? The estate of "the richest man in Vienna” could be like any estate up here. It's not like I thought, oh, let's make it contemporary. I thought, it's so important today that people realize there are the patrons, and there are the other people, and how do we all mix together? But I'm just as interested in a period piece. Butterfly is really very period. It's set partially in the American consulate, but still in Nagasaki at the turn of the century. I'm working on Candide for next year, and I'm setting it right in the middle of the Enlightenment. I don't think, "Let's update this piece." I think, "How can I best tell this story? What are the visual cues that will help the audience? How will the characters relate? Who is that character going to be?" For me it's all got to start with the people. Once you get the people right, you'll get the world right around them. It doesn't have to be totally representational. We're doing Dialogues of the Carmelites this year in Washington, and of course I've set it totally period. The setting is abstract. It doesn't look like France at the end of the 18th century--it's just some spaces. But the clothing is very period. Sometimes I teach classes, and young directors say to me, "I'm going to set it in ...." That might be an interesting idea, but first let's start where the composer wanted to set it. Let's understand that world, socially, politically, visually. And when you know those things, then you can find parallels in other worlds. For example, I was teaching a class in The Marriage of Figaro, and I asked them how many people really know about the French Revolution? How many people really understand what was going on? What is the droit du seigneur? What was happening in art when Mozart wrote this piece? What was happening in Vienna? What was happening in Prague? Why was he traveling between those two places? If they can't answer these questions, I don't want to hear about their plan to set it on a tennis court. That's not informing the work. It's putting a frame around it, instead of getting the canvas out. You're doing a Vivaldi opera next season. You presented a Lully opera in 2012. How do you balance the need to sell tickets with your responsibility to serve the art? It's a difficult question. When you do an lesser-known opera you really have to streamline it. Get it out there, let people hear it, but you can't do huge productions of those works. Producing a rarity like Bianca e Falliero today (she directed the US premiere of Rossini's redicovered opera in 1987—we'd discussed it earlier because I was in the chorus of that production) would be extremely difficult to justify economically, whereas something like Madama Butterfly will not only sell tickets but also be rented to other companies as a production. Opera companies can't do those shows unless they have a huge repertory, unless they're doing ten shows. You have a long list of honors and accolades. One of DC's most powerful women! One of the ten most powerful women in music! I hope you'll use your powers for good! I feel a responsibility now to do that. One of the great things about running a company is that it's not just about me. It's about all of us. It's hard, but it's satisfying, because I'm passionate about it. I wouldn't be doing this if I wasn't passionate about it. I feel fortunate to be someone doing something I deeply love. On Monday, July 21, I saw the second performance of Madama Butterfly at the Glimmerglass Festival. Another triumph, another visually stunning show, more great performances. I'm running out of accolades to use when describing what I see at Glimmerglass. 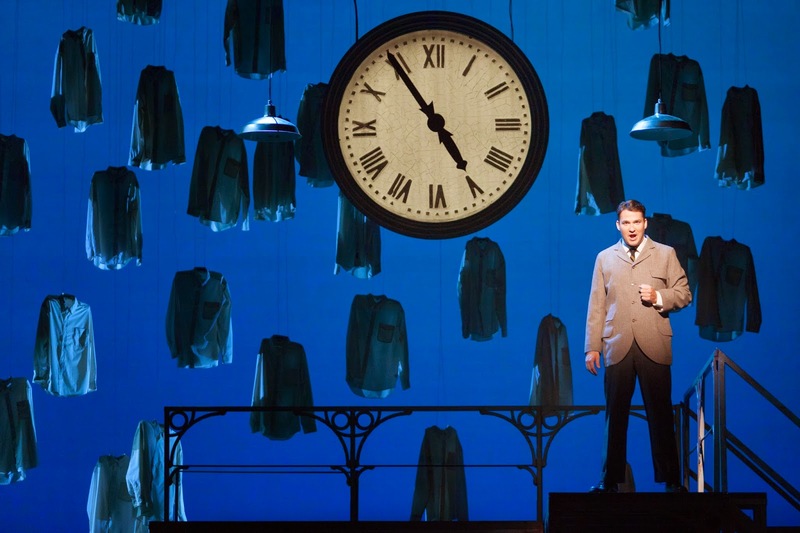 With Michael Yeargen's sets, Robert Wierzel's lighting, and Anita Yavitch's costumes, all the visual elements combined effectively to create a strikingly beautiful and fluid effect. Director Francesca Zambello has set some scenes in the American consulate in Nagasaki instead of Cio-Cio-San's house, the original setting. The intent was to place additional focus on Cio-Cio San's outsider status both in her own community and in the community of Americans in Nagasaki. 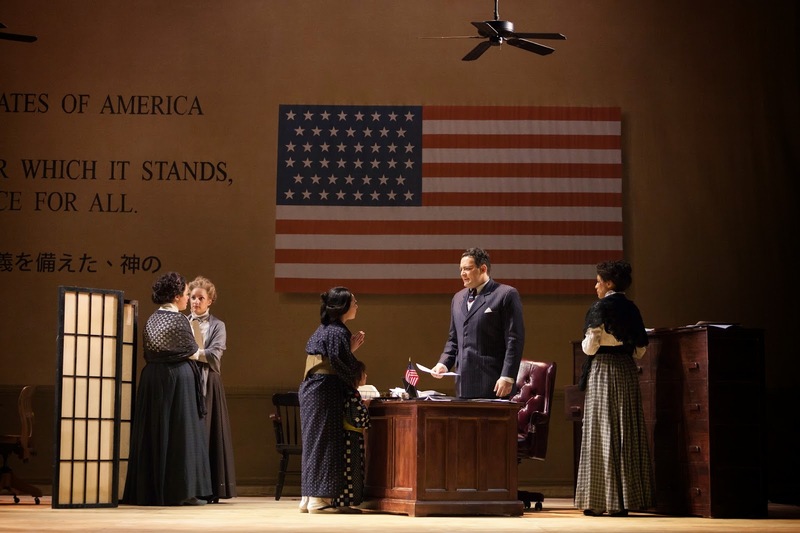 Yes, that intention was met, with the additional bonus of showing how common it was for Japanese women to have half-American babies and seek aid from the consulate, but I can't say it added much to the opera for me. In fact, I wound up wondering why all these American women were working in an American office in Nagasaki. Wouldn't any American woman in Nagasaki at that time be there because of her husband, and not be working outside the home? And wouldn't any single American woman be unlikely to find herself in Nagasaki? No matter. Back to the superlatives. A shining cast of young guest artists and Glimmerglass Young Artists brought the opera to life. Yunah Lee and Dinyar Vania have sung Cio-Cio San and Pinkerton before many times, and proved they have the vocal goods, particularly as the afternoon warmed up and so did their voices. They were at their best vocally and dramatically in the last act, which we all know is devastating. 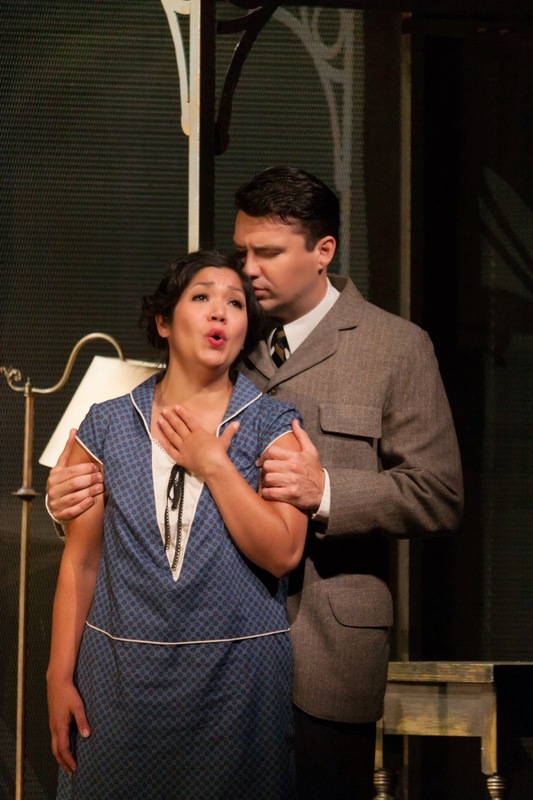 Kristen Choi was a very effective Suzuki, and Aleksey Bogdanov was also a good Sharpless. Both are thankless roles that require excellent singing and acting. Sharpless in particular does a lot of listening, and must react to what he's told. As usual, smaller roles were fulfilled by members of the Glimmerglass Young Artists Program. Ian McEuen in particular deserves praise for his Goro. 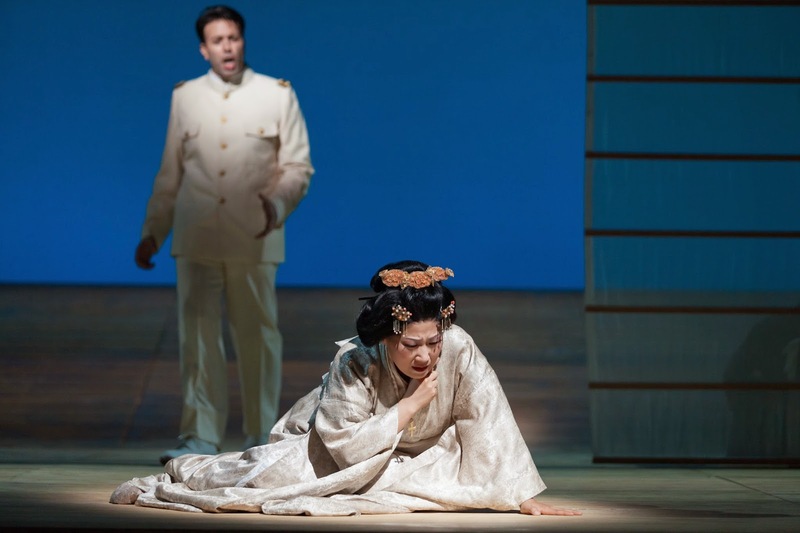 Madama Butterfly runs through August 23 at Glimmerglass. Once again, I recommend this show. P.S. I saw the next performance of Madama Butterfly on Thursday, July 24. Much, much better performances vocally and dramatically from all. I didn't mention it before, but I think the fact Monday's show was a matinee had an effect on the singing. One single concept still irks me--using the US consulate instead of Cio-Cio-San's house for some scenes. So some of the chorus music is sung by people in 1904 American garb, instead of people from Cio-Cio-Sa's own community. The text makes more sense to my feeble mind if it comes from her community--mocking her naive pride, berating her for abandoning her own traditions to adopt American ways, etc. I have made public before today my opinions on updating operas from the time they were intended to the current time, or from a remote past to a less remote past. I have stated that the usual intended purpose--to clarify social roles and power structures--is usually not met successfully. I have stated that attention to period detail--or worse yet, inattention to period detail--can provide more distraction than clarification. Disregard all that. 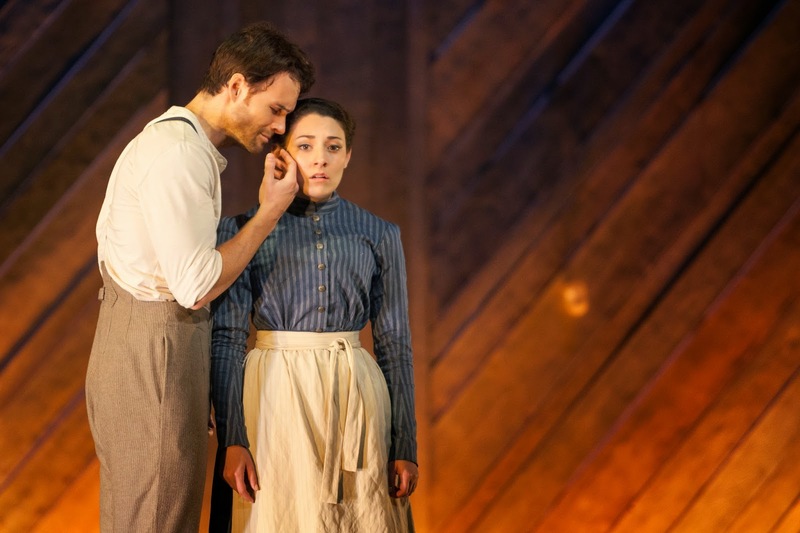 The opening of the Glimmerglass Festival's production of Ariadne auf Naxos--rather, Ariadne in Naxos--provided insight aplenty and many, many sensory pleasures! As Francesca Zambello stated when I spoke to her recently, why shouldn't this extravagant entertainment be thrown as part of some house party at one of the many grand estates in New York? New York has an Ithaca, a Syracuse, a Utica--why not a Naxos? Think Rockefeller instead of Esterhazy. I believe in this case the update worked! 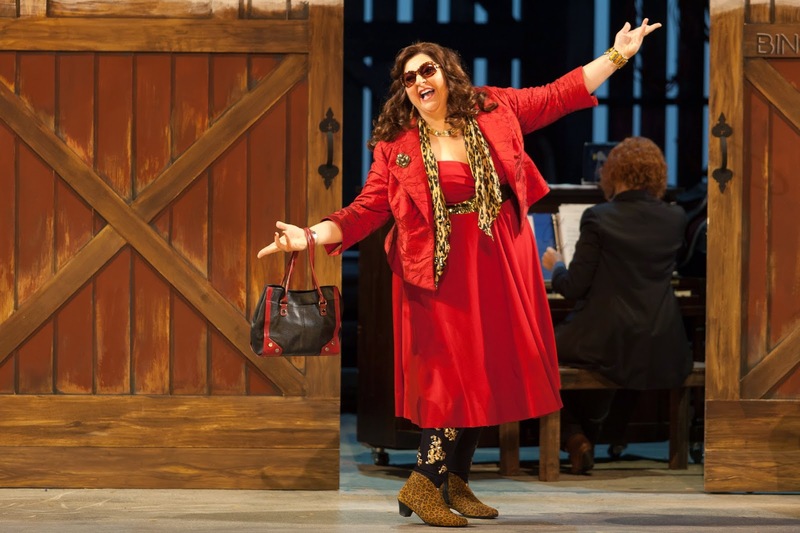 Ariadne auf Naxos is already a silly story, but often the comedy is not clear enough. This new English version by Kelly Rourke made sense out of what has always seemed to me to be a chaotic Act I. The richest man in Vienna (or Cooperstown?) has arranged for an evening's entertainment to include both a new opera and a popular song and dance troupe. The fact the evening's entertainment includes both is appalling enough, but, in the interest of finishing the entertainments in time to see the scheduled fireworks display, the assembled parties are instructed to combine the two so that the patron will be satisfied in seeing both contracts fulfilled. (I was still thinking in legal terms after Justice Ruth Bader Ginsburg's program that afternoon.) Act II is the combined opera seria of the serious young Composer we met in Act I with the commedia dell'arte-inspired song and dance act. Updating the story to what could be today at a grand estate in upstate or central New York worked for me. The diva behavior of the Prima Donna and the Tenor is timeless. The naive, reckless, idealistic behavior of the Composer is timeless, as well. Making Zerbinetta and her troupe of commedia dell'arte players into a girl singer and her boy-band dancers might be a bit dated already, but that's part of their charm. The Tanzmeister (very well done by John Kapusta) becomes something of a manager for the boy band, and the Musiklehrer (quite nicely performed by Adam Ciofarri) becomes the Composer's agent. Taking the pants off the Composer, a role always sung by a mezzo pretending to be a naive teenage boy, also makes sense. Catherine Martin acted the naive, young, self absorbed Composer quite effectively, and sang quite beautifully. Her bio lists roles much heavier and lower than those associated with women who sing the Composer, so she deserves additional kudos for successfully negotiating this fiendishly high mezzo role. I liked the directorial touch of having her on stage for much of Act II, although her role is usually considered done at the close of Act I. In Act II, when we see the Composer's very, very serious opera (auf Deutsch, to show just how serious!) juxtaposed against the pop sentiments of Zerbinetta's troupe (in American English), we see even more of a payoff. In fact, one of the best moments is when the four dancing boys sing in German, seeming to mock Ariadne's grief. I can not praise the cast highly enough! Christine Goerke, whom I truly did not praise highly enough when I saw her as the Dyer's Wife in Die Frau ohne Schatten at the Met last spring, was a delight to see and hear as the Prima Donna/Ariadne. Full, luscious tones that were most at home in the huge, Wagnerian phrases of "Es gibt ein Reich" and her final duet with Bacchus. ZOMG, as the young people say! Ms. Goerke has a wonderful sense of humor, and seemed to relish in poking fun at the Prima Donna character. She was accompanied quite ably by Beth Lytwynec as Dryad, Jeni Houser as Naiad and Jacqueline Echols as Echo. 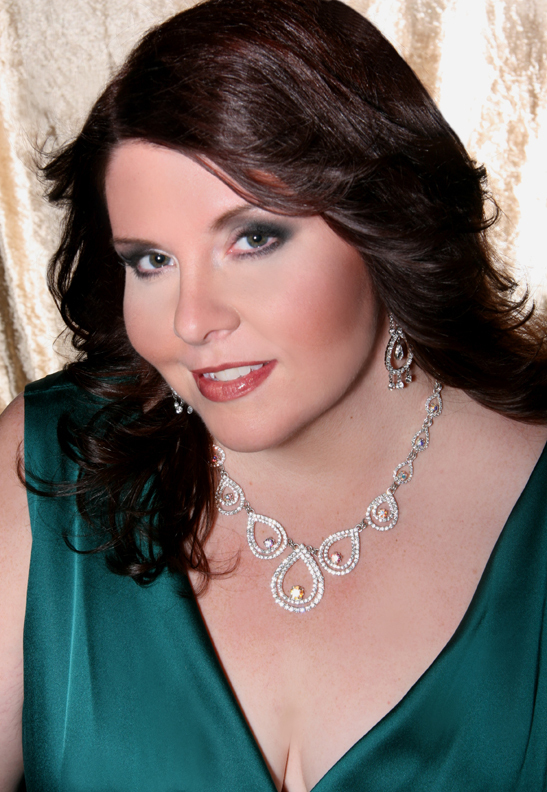 As Zerbinetta, Rachele Gilmore brought a sound that grew in beauty through the evening so that her showpiece aria in Act II was not only a delight, but an almost explosive joy! Tiny and beautiful, this young woman made the most out of Zerbinetta's earthy yet idealistic sentiments, while also controlling the four dancing boys portrayed with great charm and wit by Carlton Ford, Gerard Michael D'Emilio, Andrew Penning, and Brian Ross Yeakley. Carlton Ford's Harlekin was especially charming and self absorbed, and Mr. Ford's singing was lovely to hear. 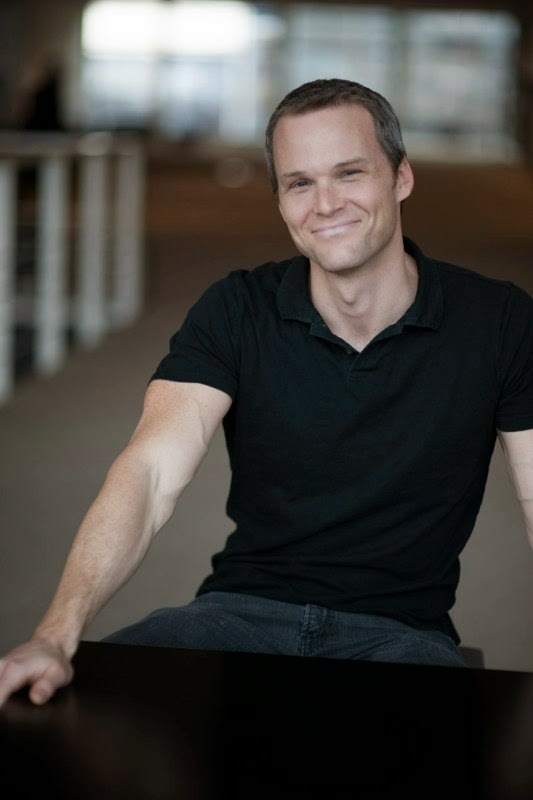 Corey Bix sang the demanding role of Bacchus in glorious, unforced tones. (I have to confess I never find that role very interesting, though.) 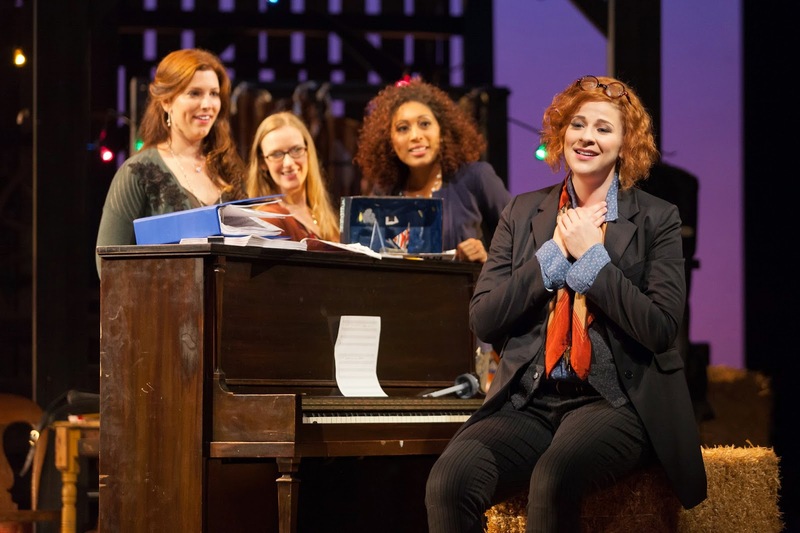 Musical theater veteran Wynn Harmon seems to have already established himself as a staple of the Glimmerglass stage, and as the Manager of the Estate, he was delightfully arrogant and pretentious. I have to praise the creative team in the highest terms! 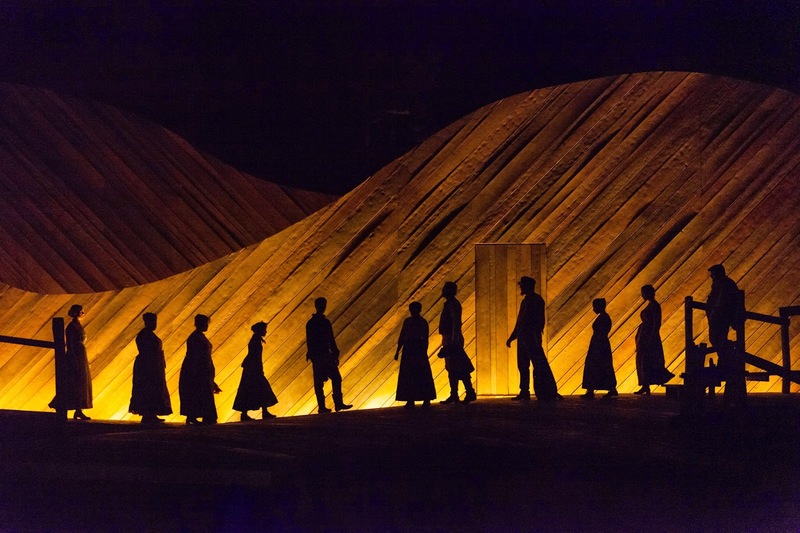 Director Francesca Zambello, scenic designer Troy Hourie, costume designer Eric Teague, lighting designer Mark McCullough, choreographer Eric Sean Fogel (whom I've praised before)--the work of all was simply stunning. Conductor Kathleen Kelly brought everything together quite beautifully. Ariadne in Naxos continues through August 23. Once again, I highly recommend seeing this Glimmerglass show. As I have many times in past years, I ventured up to Katonah, NY, for a beautiful evening of singing at Caramoor's Summer Music Festival. You will recall my fondness for this venue, for the beautiful surroundings and the opportunity to hear fresh, young talent alongside more accomplished professionals. The work that Will Crutchfield, Director of Opera at Caramoor, and his team do is to be commended. On Saturday, July 12, the main event was Mr. Donizetti's Lucrezia Borgia, (libretto by Mr. Felice Romani, based on Mr. Victor Hugo's play, Lucrèce Borgia). As usual, there was so much more than that one opera on offer! I like to arrive early and hear the afternoon lectures and concerts of apprentices and young artists, and once again I was quite happy I did. The first sung program was called "Bel canto a due", which has become a popular series of young artists singing, as you might imagine, bel canto duets. Mr. Crutchfield explained that these are wonderful duets not only for their beauty but also for the learning opportunities in singing such intricate music with a partner. Another program showcased other musical settings of Victor Hugo's verse, including Mr. Liszt's familiar "Oh! quand je dors" and an adorable duet from Mr. Mendelssohn's setting of Ruy Blas. All of the afternoon's singing was quite good, and I regret that I can't name everyone who impressed me. 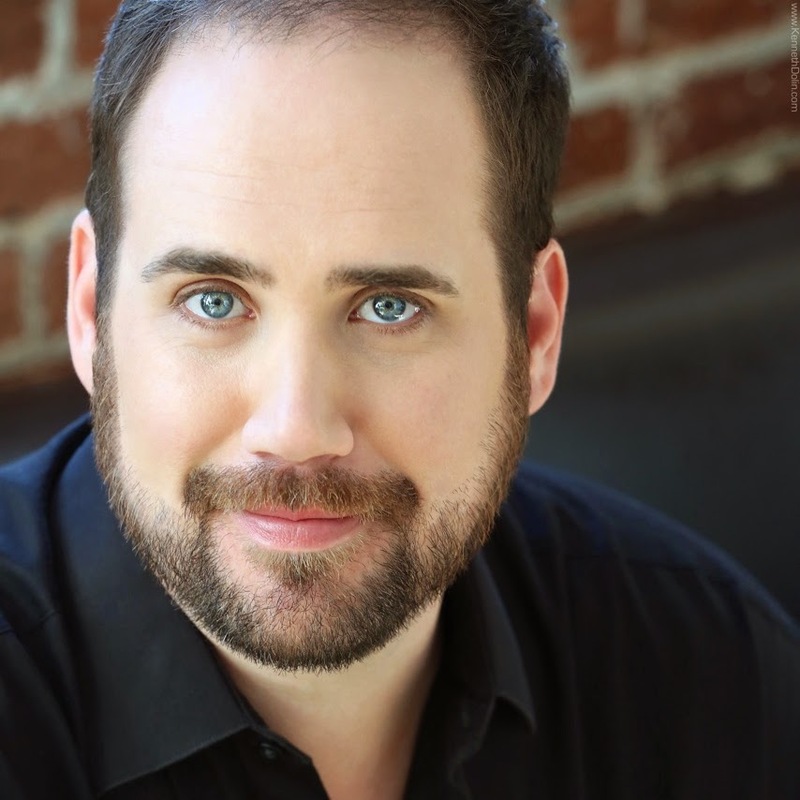 Bass-baritone Joseph Charles Beutel continues to dazzle with his singing, his acting, and his youthful looks. Hsin-Mei Tracy Chang gave a lovely and tender performance of Mr. Gounod's setting of "Sérénade", and Yunnie Park sang a shimmering "Oh! quand je dors". Among the other singers I wish to name were soprano Elise Brancheau, mezzo Desiree Maira, tenor Scott Brunscheen, and baritone Joel Herold. Again, I can't name everyone, but rest assured there was not a dud in the bunch on Saturday afternoon! On to the main event! Mr. Donizetti's score is full of all the melody, the fioritura, the drama that we have come to expect from his works. Interestingly, Mr. Crutchfield chose to perform the 1833 version on Saturday night, but will perform the 1840 version, which follows Mr. Hugo's play more closely by replacing the soprano's final solo scene with a finale for the soprano and tenor, on July 18. 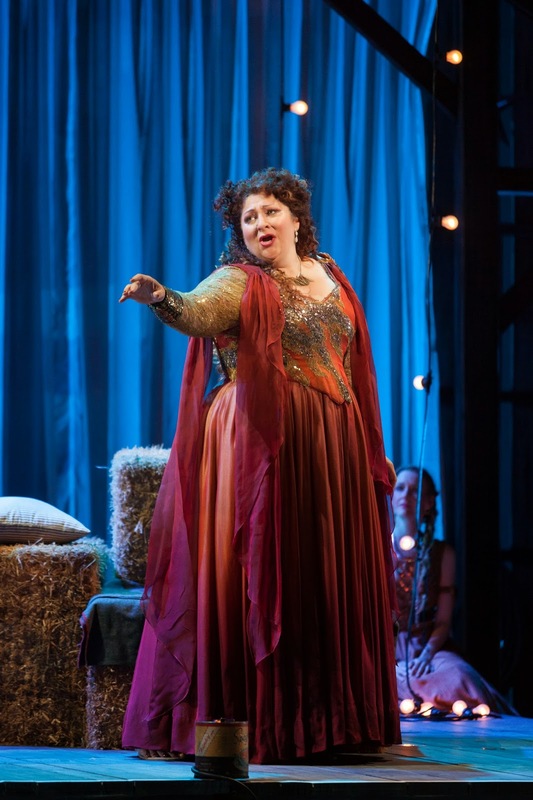 As Lucrezia, Angela Meade gave us all that we know of her--smooth line, beautiful tone, musically expressive presentation--and added a passion I haven't seen. I am happy to say the young lady, still in her 30s, is growing artistically. Christophoros Stamboglis, who wowed us last year in Caramoor's Don Carlo, gave us a passionate and vengeful Alfonso D'Este, Duke of Ferrara and Lucrezia's husband. Always singing beautifully while still portraying the many emotions of the Duke, Mr. Stamboglis was a highlight of this production. 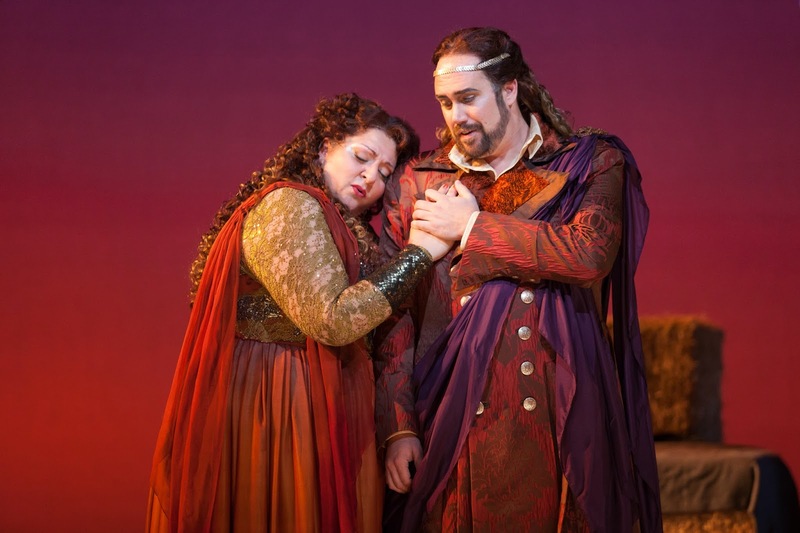 Tenor Michele Angelini has graced these pages before, and I must say I can only praise his performance as Gennaro, Lucrezia's illegitimate son. 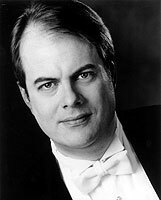 He is making quite a name for himself in the high, florid bel canto repertoire, and while I see the role of Gennaro as perhaps a bit beefier than the Elvinos and Lindoros for which Mr. Angelini has garnered much praise, he handled it with great ease. As Orsini, close friend of Gennaro, Tamara Mumford gave a dazzling performance. Looking both dashing and beautiful, and singing with a luxurious tone and great ease, Ms. Mumford earned the roars of approval she received at the curtain call. 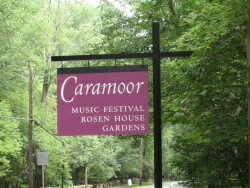 The smaller roles were sung quite ably by Caramoor young artists and apprentices. 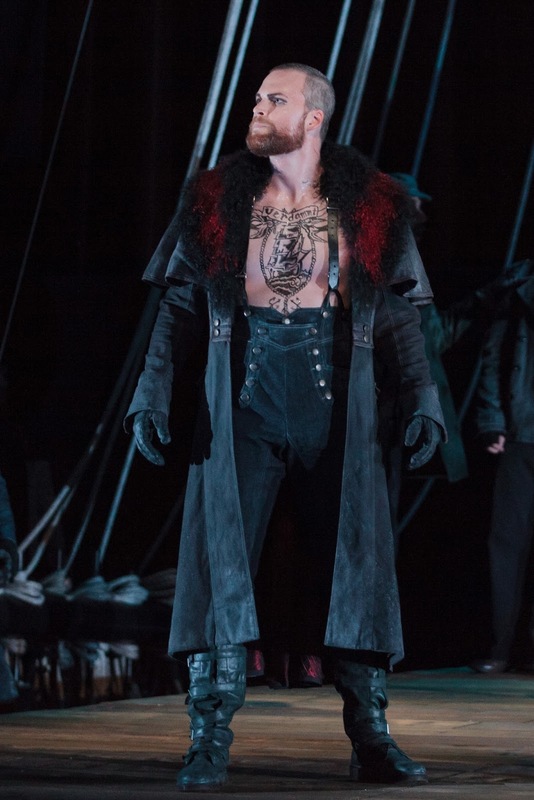 Standouts include Mr. Beutel, of course, as an aide to Lucrezia, and tenor Cameron Schutza, whose featured role as Rustighella, one of the Duke's henchmen, gave him lots of stage time. As always, the Orchestra of St. Luke's and Will Crutchfield gave a stellar performance of the demanding score, beautifully paced, shaped and nuanced.